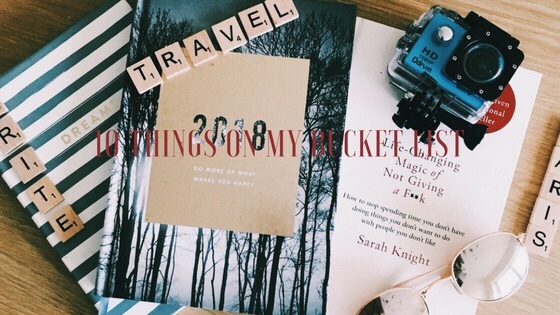 Whilst I look through my goals for the year once New Years rolls around, I also like to take a little browse on my bucket list for life. I like to see what things I’ve been able to tick off (if any), or if they need any editing, adding things I’ve seen or because I’ve changed my mind and actually I don’t really want to ever run a marathon, not even a half (yes, that really has been on my list before now)! Gossip Girl made me want to run away to Paris for entire summers, wearing pretty dresses and getting swept up in the romantic air, underneath the Eiffel tower while eating my body weight in macaroons (anyone else?) and to think it’s literally on our doorstop, it’s a crime to not visit it! Plus, it would be easily tied in to Disneyland and the Air Bnb’s I’ve had a little look at are super cute! (HINT HINT). I mean do I have to say anything other than pizza, wine, cheese, PASTA, bread, more pizza, wine, wine… did I mention the wine? Oh, and it’s a beautiful country and there’s Rome so I can re-enact scenes from Lizzie McGuire, as well as Pompeii and volcanoes. Basically, Italy is me as a country and I would very much like to go. This has been my dream ever since I can remember. I was watching TV one day and Steve Irwin came on talking about animals and something set a spark off in me and I wanted to do that too. Whilst life hasn’t really taken me in that direction, I’ve never lost my love for animals and because the Irwin family were the ones who inspired me from such an early age, I would love to visit their place of conservation. I would be crying the whole entire time and I’m totally a fangirl of Bindi’s but I’d absolutely LOVE it, as well as been able to swim in the Great Barrier Reef. I spoke quite a bit about this in my latest blog post, which you can read here. Bit of a funny one if you know me because I’m highly uncoordinated with no sense of balance whatsoever and a slight fear of the ocean. I saw the film Soul Surfer a few years ago and if you haven’t seen it – you need to. It’s about champion surfer Bethany Hamilton, who was involved in a shark attack back in 2003 and lost her left arm due to it, however that didn’t stop her and she’s still an amazing surfer to this day. That film inspired me to both go to Hawaii and surf because even though she was involved in something horrific, she still goes out into the ocean every day. If someone who has an actual reason to fear the ocean can do it, then so can I. This has been something I’ve wanted to do for the past couple of years now and especially since I am now studying social work. I think that learning sign language should be as compulsory as learning a second language is now because everyone deserves to be able to communicate with others around them. If you haven’t seen the video of the woman who goes around Disney and teaches the characters sign language, so they can speak to deaf children, watch it HERE, and if that doesn’t make you well up, then I don’t know what will! In my secondary school, learning a language was mandatory and me being 15 thought; ‘I’m never going to use this, everyone speaks English.’ I’m ashamed to say I probably gave up before even really trying but I can at least read and write some german (ich sprechen nicht Deutsch) and by a miracle I managed to scrape a generous C. However, I wish I could go back and shake myself and tell myself to try and not be embarrassed about not pronouncing words correctly, it’s definitely something I would like to do, and a goal would be to speak fluently in another language – BECAUSE IT IS ACTUALLY IMPORTANT 15 YEAR OLD JESS!! To be honest, I’m not quite sure why I want to do this one. I went on a school trip to Snowdon and climbed a third of the way up, we didn’t see the summit because it was too cloudy, and I remember laying on some grass by a lake and thinking ‘one day, I’ll climb to the top of here.’ I’m not even sure why I thought it then either because I’m not that much of an outdoor-y kind of gal! I much rather prefer to stay warm, inside, under a blanket or three. However, I am slowly learning the benefits and importance of getting outside every day so maybe it’s more a fitness goal for later in life. The theatre bug will not stop biting me lately. I keep seeing incredible shows and having all these ideas of performances and it makes me so excited. There is nothing quite like the rush you get when you stand on the stage and I would LOVE to get back into it! I’ve had a look around at theatre groups but haven’t committed myself to one at the moment so hopefully this will be achieved soon! So, there’s a brief insight into my bucket list, after reviewing it from 2017, I would love it if I could tick at least one thing off this year but who knows where 2018 will take me! Hope you’ve enjoyed reading this post, let me know what kind of things are on your bucket lists, I’d love to know! I’d love to visit Italy and Australia, they both look truly amazing. I’m currently learning sign language, it’s great I definitely recommend you do. These are some great things on your bucket list!